These are relatively short activities designed to quickly reinforce and apply a marketing concept/model. These teaching activities can be used equally in a lecture or a discussion class.Typically they should be completed on an individual student basis. As suggested by the name, discussion exercises are designed to be completed in a small group of students, usually with the intention of feeding back into an overall class discussion. In most cases, the students are presented with a specific marketing situation and are often asked to connect the topic back to aspects of marketing theory, identify advantages and disadvantages, and then reach a conclusion or business recommendation. Role-play exercises have been categorized under ‘discussion exercises’ and are, therefore, quite similar in structure.Where they differ is in the presentation of the initial information, which is in the form of a summary from a manager’s marketing meeting. This gives the students an insight into the range of business views.These exercises can either be used as straight discussion activities or utilized as actual role-plays, where the students can read out the ‘script’ or even take the role of one of the meeting’s participants. With the decision activities, students need to make a marketing decision. Usually a difficult marketing scenario is presented (that is, one where several approaches are viable). The task of the student in these activities is weigh up the for/against of a number of marketing options and select and argue for one approach. On this marketing teaching resources site, the mini case studies have been placed in the same category as decision activities (see how to search). Therefore, they are similar in structure and design. However, the initial marketing information that the students are presented with is slightly different. The students will generally have 3-5 paragraphs outlining the marketing situation of either a real or hypothetical firm (see below why hypothetical case studies are often used). The final teaching activity style is a marketing news item. These are summarized versions of a firm’s media release (they will also be a link to the article an online newspaper). 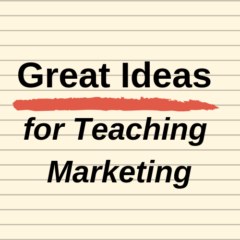 Therefore, the students review a summary of an article, usually about a marketing initiative or challenge, followed by a range of discussion questions.There are only a few news items currently on Great Ideas for Teaching Marketing, but this section is planned to be expanded as new teaching activities are added.